Happy birthday Penelope Lively (Dragon Trouble), Zibby Oneal (The Language of Goldfish), Keith Baker (LMNO Peas), Ralph Fletcher (Fig Pudding), and Patrick McDonnell (The Gift of Nothing). It’s the birth date of Kate Greenaway (1846–1901), Under the Window; Ennis Rees (1925–2009),Brer Rabbit and his Tricks); and Lillian Moore (1909-2004), My First Counting Book. It’s St. Patrick’s Day, first celebrated in the United States in 1756 in New York City at the Crown and Thistle Tavern. Read Saint Patrick by Ann Tompert, illustrated by Michael Garland, and Patrick: Patron Saint of Ireland by Tomie dePaola. 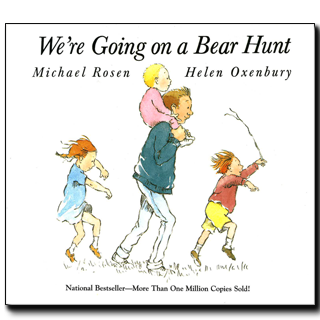 March has been designated March into Literacy Month, and when I think of that idea, a particularly brilliant book comes to mind—We’re Going on a Bear Hunt by Michael Rosen and illustrator Helen Oxenbury. This book completely belongs to both author and illustrator. Michael Rosen took a chant for children that enticed him, and set out to re-create it in words that would engage the youngest listeners. Then Helen Oxenbury took this light soufflé of a text and turned the book into an amazing family adventure—with characters and plot created solely by her. If you have used We’re Going on a Bear Hunt once with young children, you have probably read it about a hundred times. Sometimes I can’t remember my street address, but I can call up this text in a heartbeat. What a fabulous narrative it is! As the family goes out to hunt for a bear, they traverse grass (“swishy swashy”), mud (“squelch squerch”), and snow (“hoooo woooo”). Strong rhythm and rhyme carry the text along, inviting participation, until the family finds the bear—and then runs from it! “We’re not going on a bear hunt again,” the final line says. But readers will want to again and again. Black-and-white pages, where the plot is set out, alternate with full-color spreads of a family (father, mother, three children, and a dog) as they brave the elements. Helen Oxenbury provides action and drama on every page. She manages to run multiple illustrative story lines simultaneously, with beautifully balanced compositions on each double-page spread. I particularly enjoy following the family dog, who plays a silent but intriguing role. 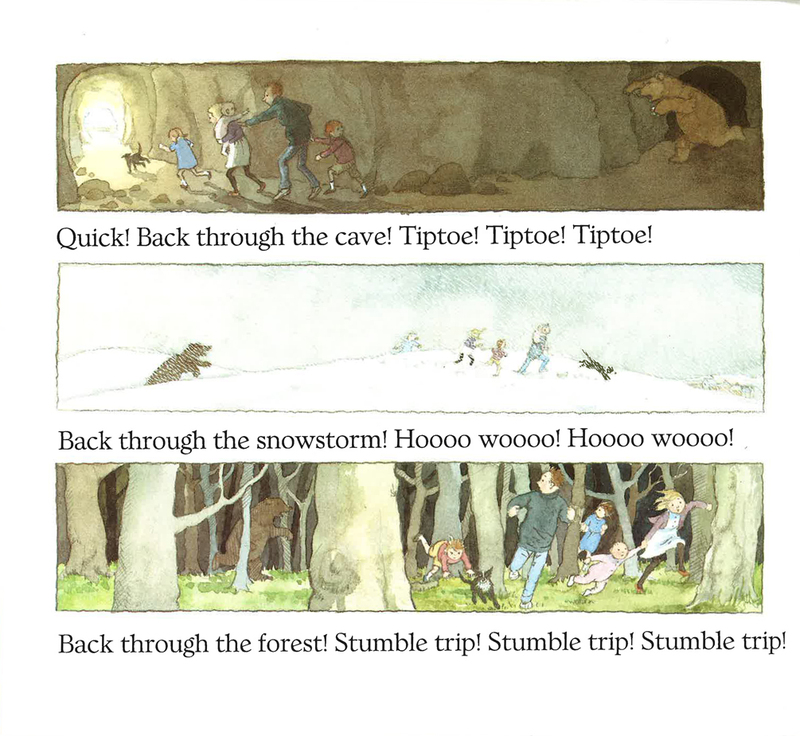 Brilliant art, a text that reads aloud beautifully—books for our youngest readers birth to three don’t get any better than We’re Going on a Bear Hunt. There are many editions, probably the most popular one being the board book. But I own the twentieth-anniversary edition and love it for the spacious pages and superb color reproductions. Whatever version you use, you will truly be able to get young readers to march and run and leap into literacy when you use this classic book with them. Happy twenty-fifth anniversary We’re Going on a Bear Hunt! May you have many, many more. Originally posted March 17, 2014. Updated for . I haven’t encountered ‘We’re Going on a Bear Hunt’ yet, but it does seem like the type of book that inspires rereads. The snippets of illustration in this entry alone stir my imagination (I particularly love the trudge through the snowstorm; it’s simplistic beauty), and the text as Anita describes it fits a wonderful, communal atmosphere between parents and children. I suspect I’ll become familiar with ‘We’re Going on a Bear Hunt’ in the near future. What a great title! Oh my. How I love this book! Wonderful artwork. In fact, if I pick that book up, I find myself going back to the beginning and reading and looking at the pages all over again. Maybe three or four times. And the flow of the text reminds me of Mark Twain’s comment about getting little lines from songs marry-go-rounding in your head, and not being able get loose from them. But I LOVE. LOVE, LOVE, LOVE this book. My kids loved this book so much we wore out two copies of it! This lovely book is my go-to baby shower/birth gift (along with a few other favorites – have to get that 1000 books before kindergarten goal reading path started).